New design concepts come out every day. We have selected a few that we find are the most interesting. Today we've got four different videos exploring concepts like a 5.5-inch display iPhone 6, the future of iOS, or a brand new device, the iRing. The first video shows an iPhone 6 that takes some cues from the leaks having showed up online. At first sight, the phone looks like a larger iPod touch with a centered iSight camera. The device has a 5-inch retina+ screen with a resolution of 522 ppi and runs on iOS 8. The designer chose not to have the edges rounded as the leaks showed, but to make them square, making it look closer to the current iPhone 5s model. This phone has stereo speakers and an IR blaster on top and another set of stereo speakers at the bottom. The iSight Camera comes with a 13-megapixel sensor and 4K video recording. The two-tone LED flashlight is now centered around the camera bezel. The second video shows the new iPhone 6 Air, a device sporting a 5-inch screen and multiple colors for the backplate. You get to choose between red, orange, and violet. The new thing here is the iRing, a device that comes in the same package with the iPhone 6 Air and rests on your finger. 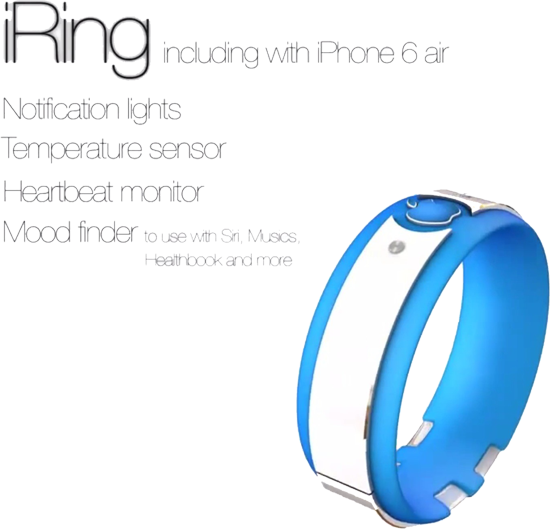 The iRing has notification lights, temperature sensor, heartbeat monitor and doubles as a mood finder. Basically, the device can listen to your voice, via Siri, and work with the Healthbook app to control the iPhone. The iRing has an Apple logo on top that works as an LED. The third video shows some old concepts that were updated for 2014. The iPhone 6s has a transparent display and no back side. You can actually see though the device when you use it. And last but not least we have an independent version of iOS 9. In this designer's concept, the future version of iOS will have new dynamic wallpapers and pretty awesome animations and effects for the home screen icons. iOS 9 will bring a Widget Store so you can purchase your own notification center bits to give you the information you need at a glance. Widgets will be available in Control Center as well. Just type a word and you will get two buttons to search for that term on Wikipedia or the built-in dictionary. The multitasking mode will have new animations as well, and when you click and hold an App Icon, you will be presented with a window that shows the size of the app and a link to the App developer's webpage. Check out the videos below and remember that these are just nice concepts.